The MR556A1 uses the HK proprietary gas piston operating system, employing a piston and a solid operating “pusher” rod in place of the gas tube normally found in AR15/M16/M4-style firearms. This method of operation virtually eliminates malfunctions that are common to direct impingement gas systems since hot carbon fouling and waste gases do not enter the receiver area. This is the same key feature critical to the success of the HK416 rifles used by leading military and law enforcement customers. 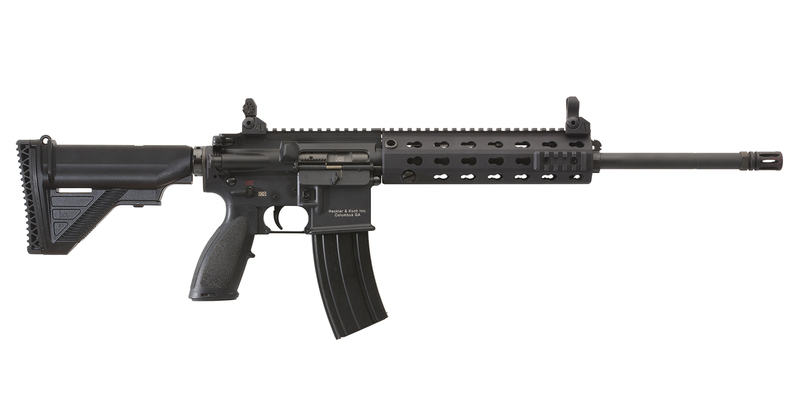 The MR556A1 is produced in the USA using American and German made components. The MR556A1 uses many of the same assemblies and accessories originally developed for the HK416 including the HK free-floating four-quadrant rail system. The HK Free Floating Rail System (FFRS) handguard has four MIL-STD-1913 “Picatinny” rails and allows all current accessories, sights, lights, and aimers used on M4/M16-type arms to be fitted to the MR Series. The HK rail system can be installed and removed with simple tools and returns to zero when reinstalled. Like the famous HK416, the MR556A1 uses a German-made barrel produced by Heckler & Koch’s famous cold hammer forging process. The highest quality steel is used in this unique manufacturing process producing a barrel that provides superior accuracy and long service life. But unlike the HK416, the MR556A1 does not use a chrome-lined barrel. Chrome-lining can sometimes mask bore imperfections and negatively affect accuracy. For the new series of Heckler & Koch semi-automatic MR rifles, HK designers and engineers believe best accuracy comes with an unlined bore. Used with the HK Free Floating Rail System, the barrel does not touch the handguard, ensuring the barrel is truly free-floating for maximum accuracy. The unchromed barrel has an internal profile of 6 lands and grooves with a 1 in 7 inch (178 mm) twist. It is also moderately “swagged” with a slightly smaller internal diameter at the muzzle end than the chamber end. This feature has a positive effect on bullet accuracy and velocity. The thick, heavy contour 16.5-inch MR556A1 barrel also contributes to its excellent accuracy. The MR556A1 is being produced with the same commitment to quality as German-made HK firearms. By using joint U.S./German manufacturing, Heckler & Koch leverages the relative strengths of two continents to make the preeminent AR-type firearm, combining the designs innovations of the USA and Germany into one new product. The MR556A1 rifle includes a 10 or 30-round steel magazine, set of Troy Industries Micro mechanical sights, HK multi-tool, lock, and case. An accessory MR556A1 Upper Receiver Kit is also available for $2,195 and allows most high-quality AR rifles to be converted to the HK piston-driven operating system.